The head of a Briard always gives the impression of length, having sufficient width without being cumbersome. 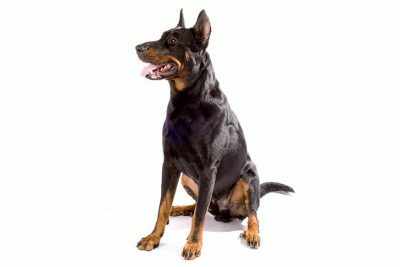 The correct length of a good head, measured from the occiput to the tip of the nose, is about forty percent (40%) of the height of the dog at the withers. There is no objection to a slightly longer head, especially if the animal tends to a longer body line. Viewed from above, from the front or in profile, the fully-coated silhouette gives the impression of two rectangular forms, equal in length but differing in height and width, blending together rather abruptly. The larger rectangle is the skull and the other forms the muzzle. The head joins the neck in a right angle and is held proudly alert. The head is sculptured in clean lines, without jowls or excess flesh on the sides, or under the eyes or temples. Neck – strong and well constructed. The neck is in the shape of a truncated cone, clearing the shoulders well. It is strongly muscled and has good length. 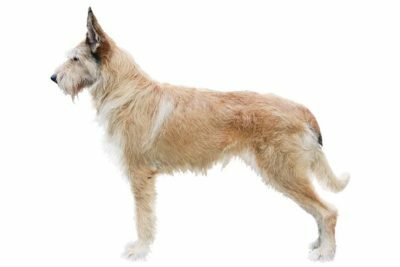 Topline – the Briard is constructed with a very slight incline, downward from the prominent withers to the back which is straight, to the broad loin and the croup which is slightly inclined. The croup is well muscled and slightly sloped to give a well-rounded finish. The topline is strong, never swayed nor roached. Body – the chest is broad and deep with moderately curved ribs, egg-shaped in form, the ribs not too rounded. The breastbone is moderately advanced in front, descending smoothly to the level of the elbows and shaped to give good depth to the chest. The abdomen is moderately drawn up but still presents good volume. Shoulder blades are long and sloping forming a 45-degree angle with the horizontal, firmly attached by strong muscles and blending smoothly with the withers. Legs the legs are powerfully muscled with strong bone. The forelegs are vertical when viewed from the side except the pasterns are very slightly inclined. Viewed from the front or rear, the legs are straight and parallel to the median line of the body, never turned inward or outward. The distance between the front legs is equal to the distance between the rear legs. The construction of the legs is of utmost importance, determining the dog’s ability to work and his resistance to fatigue. Dewclaws – dewclaws on the forelegs may or may not be removed. Feet – strong and rounded, being slightly oval in shape. The feet travel straight forward in the line of movement. The toes are strong, well arched and compact. The pads are well developed, compact and elastic, covered with strong tissue. The nails are always black and hard. Expression – the gaze is frank, questioning and confident. Eyes – the eyes set well apart with the inner corners and outer corners on the same level. Large, well opened and calm, they must never be narrow or slanted. The color must be black or black-brown with very dark pigmentation of the rim of the eyelids, whatever the color of the coat. Disqualification – yellow eyes or spotted eyes. Ears – the ears should be attached high, have thick leather and be firm at the base. Low-set ears cause the head to appear to be too arched. The length of the natural ear should be equal to or slightly less than one-half the length of the head, always straight and covered with long hair. The natural ear must not lie flat against the head and, when alert, the ears are lifted slightly, giving a square look to the top of the skull. The ears when cropped should be carried upright and parallel, emphasizing the parallel lines of the head; when alert, they should face forward, well open with long hair falling over the opening. The cropped ear should be long, broad at the base, tapering gradually to a rounded tip. The hindquarters are powerful, providing flexible, almost tireless movement. The pelvis slopes at a 30-degree angle from the horizontal and forms a right angle with the upper leg bone. Legs viewed from the side, the legs are well angulated with the metatarsus slightly inclined, the hock making an angle of 135 degrees. Dewclaws two dewclaws are required on each rear leg, placed low on the leg, giving a wide base to the foot. Occasionally the nail may break off completely. The dog shall not be penalized for the missing nail so long as the digit itself is present. Ideally the dewclaws form additional functioning toes. Disqualification – anything less than two dewclaws on each rear leg. Feet – if the rear toes turn out very slightly when the hocks and metatarsus are parallel, then the position of the feet is correct. 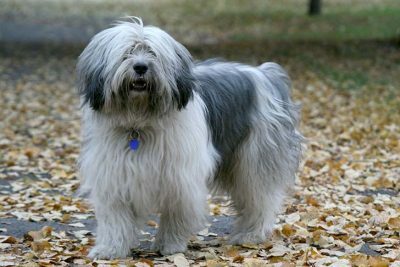 Briards are herders known for a wavy coat of either gray, tawny, or black, and an impressive head topped by a peek-a-boo hairdo parted naturally in the middle. A luxurious beard and eyebrows accentuate an expression described as “frank and questioning.” Standing between 22 and 27 inches at the shoulder, Briards are burly and rugged but move with a nimble-footed gait. They possess traits common to many other herders: trainability, brains, a protective eye toward family (especially kids, whom they regard as their flock), and wariness with outsiders. These are large, tireless dogs—it is said that just two or three Briards can handle 700 head of sheep—and novice owners might be overwhelmed by their work drive and zest for life. The Briard should do well on a high-quality dog food, whether commercially manufactured or home-prepared with your veterinarian’s supervision and approval. Any diet should be appropriate to the dog’s age (puppy, adult, or senior). Some dogs are prone to getting overweight, so watch your dog’s calorie consumption and weight level. Treats can be an important aid in training, but giving too many can cause obesity. Learn about which human foods are safe for dogs, and which are not. Check with your vet if you have any concerns about your dog’s weight or diet. Clean, fresh water should be available at all times. Begin grooming your Briard puppy long before he really needs grooming. Make sure that you make grooming time a happy period he will look forward to in the years when grooming is a necessity and can take a long time. 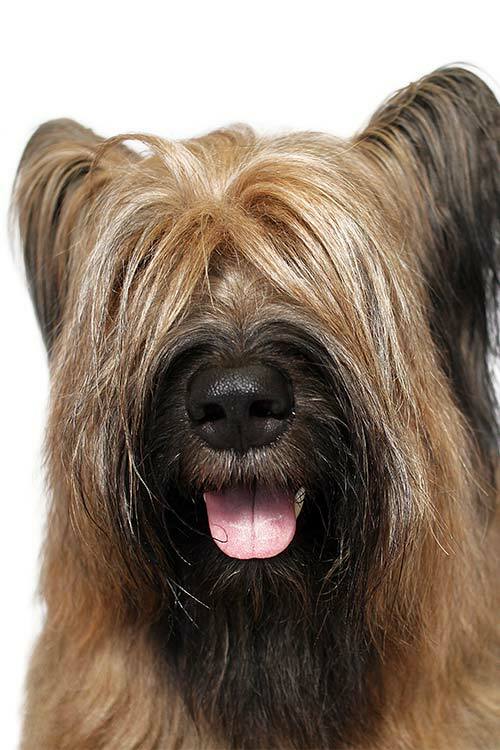 A Briard should be brushed several times a week, completely to the skin, using a good-quality pin brush. Using an undercoat rake can help eliminate a lot of dead hair and lessen shedding. The number of baths a Briard will need depends entirely on his lifestyle and the jobs he is doing. Frequency may range from weekly to monthly, to even less. The Briard requires a job to be happy. Hopefully his job will be one that gives him a lot of exercise, as this is a breed that craves action. Their zest for life makes them great companions for hikers, bicyclers, and joggers. They need a large, securely fenced area where they can run free. Chasing a tennis ball thrown by his owner can help a Briard work off excess energy as well as giving him the human companionship he loves. The Briard was bred to be able to make executive decisions without the aid of a human. Sometimes this can make them a bit difficult to train. They are eager to please, however, and when training methods are positive and the sessions kept lively, energetic, and interesting, the Briard’s natural intelligence will have him at the top of the class. Briards learn quickly and have an excellent memory. They excel at almost any canine role or sport, from catching discs to search-and-rescue, to obedience and agility. Socialization should begin early and continue throughout the Briard’s life. The Briard is overall a healthy breed, and responsible breeders screen their stock for health conditions such as cancer, hip dysplasia, congenital stationary night blindness, cataracts, corneal dystrophy, retinal folds, hypothyroidism, immune diseases, exocrine pancreatic insufficiency, and kidney disease. Discuss any questions or concerns with your breeder and veterinarian so you can make educated decisions regarding your dog’s health. In the dairy belt of northern France, the Briard, or Chien Berger de Brie as the breed is known in his homeland, has been working pastures since the time of Charlemagne. The breed is named for the dairy-producing region of Brie, best known for the gooey cheese of the same name. 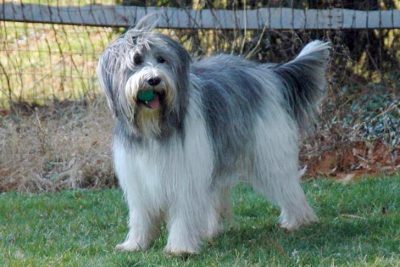 French farmers, known for frugality, developed Briards as two-in-one dogs: They are sheepherders famed for quicksilver agility, and are also tough, courageous flock guardians capable of running off sheep-steeling predators. The Briard is a close relative of the smooth-coated Beauceron, another French pasture breed known for its dual herding and guarding ability. By the 1800s, the Briard was a cherished French institution—even Napoleon, who had an aversion to dogs, was said to be a fan of the breed. 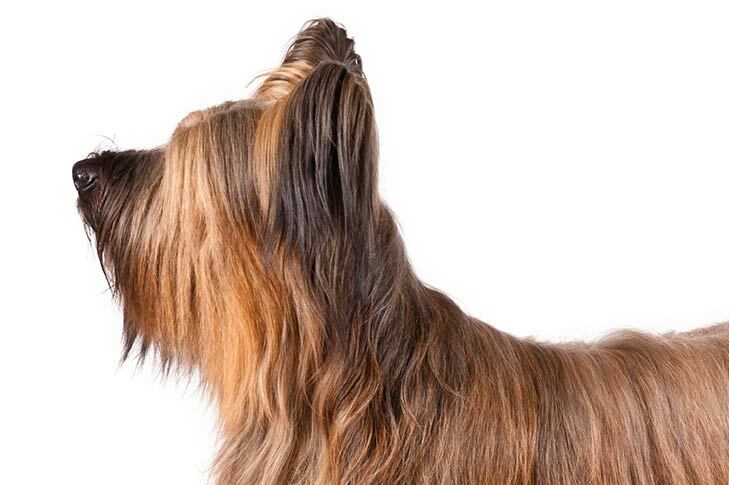 The Briard was proudly exhibited at the very first French dog show, at Paris in 1865. By the time of World War I, the Briard was so much a part of the national character that it was named the official war dog of the French army, doing sentry duty, finding wounded soldiers, and pulling supply carts. Origin stories of Briards in America feature two towering figures in the War of Independence. Thomas Jefferson enters the story in 1789, at the end of his long tenure as America’s ambassador to France. Before he departed for home, the future President acquired a pregnant Briard named Bergère (“pd. for a chienne bergere big with pup, 36 libre,” he wrote in his memorandum book). Bergère and her pups proved to be magnificent herders and all-around working dogs at Jefferson’s Virginia estate, Monticello. But, as a Monticello historian wrote, “Bergère’s employment was secondary to her role as founder of the American branch of her family.” Indeed, Bergère and her brood, augmented by exports sent from France by Jefferson’s old friend and Revolutionary hero the Marquis de Lafayette, are thought to be the Briard’s foundation in the United States. The Briard is a very old breed of French working dog. In early times, Briards were used to defend their charges against wolves and poachers, but they eventually became more peaceful herding dogs. In 1909, a French society called Les Amis du Briard (Friends of the Briard) was founded which eventually drew up a precise standard in 1925. The Briard is depicted in French tapestries as early as the 8th century. History credits both the Marquis De Lafayette and Thomas Jefferson with bringing specimens of the Briard to the Americas. Thomas Jefferson became interested in Briards while serving as minister to France. The Briard packs so much loyalty, love, and spirit into its ample frame that it’s often described as a “heart wrapped in fur.” The dashing good looks of these muscular Frenchmen radiate a distinct aura of Gallic romance and elegance.